Payment Gateway refers to an e-commerce service that authorizes payments for e-businesses & online retailers. In a way, it represents a physical POS (Point-of-sale) terminal located at most retail outlets. such as credit card numbers, to ensure that information passes securely between the customer and the merchant. Offering more number of payment gateways to the customers will increase the sales conversion rate. We help you to choose the right payment gateways and integrate it in your website. We ensure safe and secure transaction through online. We can integrate any number of payment gateways as per your choice at a small additional fee. 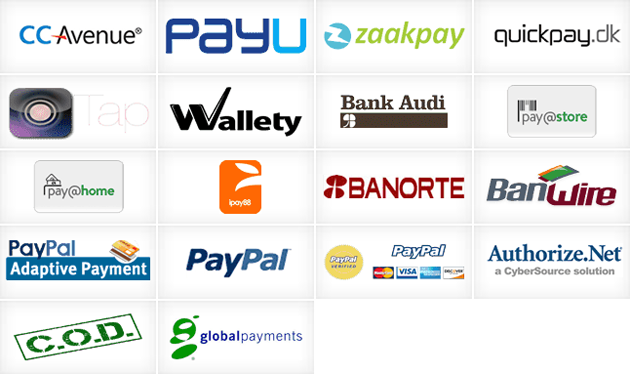 Some of the payment gateway integration we offer are given below.